Serious injuries can be devastating to individuals, family members and loved ones, especially when they are caused by the negligence of someone else. Injury can occur because of someone’s negligence, a drunk or impaired person driving a car or truck, an accident in the workplace, an auto defect, construction accidents, medical malpractice, defective product and trucking accidents. The law recognizes damages for pain, anguish, physical impairment, loss of earning capacity, medical expenses and disfigurement. Also if death occurs or serious bodily injury, family members have the right to recover for the loss of the love and support caused by the fault of another. Whether your injuries were caused by a motor vehicle wreck, an accident in the workplace, defective product or another accident caused by negligence, our firm aggressively investigates and pursues claims for catastrophic injuries and death and can handle any type of major case including serious injury. At the Law Offices of Jimmy C. Bailey & Associates, P. C. we know the law and have attracted clients from client referrals, attorney referrals from the Dallas/Ft. Worth Metroplex and other areas from around Texas. If you or a loved one has been injured due to the negligence of others, you need the services of an experienced personal injury attorney who can help you achieve successful outcomes to your personal injury cases. We understand the pain and frustration that can come with a serious injury as well as the devastation of wrongful death. 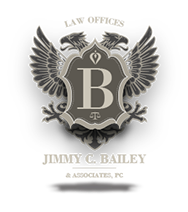 Jimmy C. Bailey & Associates, P.C. has forty years of experience and the record of representing thousands of injured people and their families and helping them achieve successful outcomes to their personal injury cases. When it comes to serious personal injury cases, our firm provides high-quality representation, compassion and knowledge of the law giving our clients the best possible chance for success.